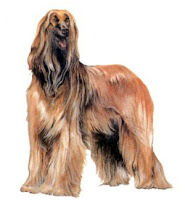 The Afghan Hound is one of the oldest sight hound dog breeds known to exist today. Known for its thick, fine, silky coat and its tail with a ring curl at the end, the Afghan Hound acquired its unique features in the cold weather of Afghanistan. This dog breed has grown in popularity and makes a wonderful companion. Care free, classy and loyal, the Afghan Hound is also very loyal but can be reserved around strangers. Socialization is a must for this breed.